Harry Nilsson was born in Brooklyn in 1941. His grandparents were Swedish circus performers and dancers, known for their aerial artistry. His father abandoned the family when Harry was just three years old—an event that Nilsson would eventually write a song about later in life. The remaining family moved to San Bernardino, California, often living with relatives due to their poor financial situation. His uncle, who was a mechanic, would have Harry help around the shop while also working with him to improve Harry’s vocal and musical abilities. He would eventually get a job at the Paramount Theatre in Los Angeles and then a bank, falsely claiming he was a high school graduate, despite only completing the ninth grade. He was good with computers, so the bank kept him on night shifts while he worked on his music during the day. By 1958, Nilsson was getting heavy into R&B artists like Ray Charles. A buddy gave him a plastic ukulele, so he learned to play it, as well as the guitar and piano. He would often get on stage and start singing classic tracks, but couldn’t remember all the lyrics—so he would simply make something up off the top of his head, which would lead to writing original material. His first commercial release was in 1966, but today I’m listening to his eighth, Nilsson Schmilsson which came out in November of 1971. To this day it’s his most successful record. It was certified Gold in the states and produced a number one hit—a remake of Badfinger’s “Without You.” The album was universally praised for the drastically different styles from one track to the next, as well as Harry’s highly emotional arrangement and soaring vocals. He would go on to win a Grammy Award for it, the second of his career. 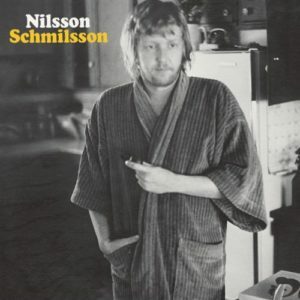 Admittedly, Nilsson was an act that I had sort of forgotten about. The track “Coconut” is a novelty track added to this album that I think just about everyone knows. Because of that song however, most listeners tended to not take the rest of his music seriously, often discounting his albums as novelty works. That really couldn’t be further from reality though, as you listen to this album today, it’s a great blend of original production and writing and putting his take on some old classics. While Harry didn’t go on to sell millions of albums worldwide, there is no question what he did was on par with any rock of folk act of the late ‘60s and early ‘70s. The production value alone of some of the tracks, the orchestral arrangements complimented by his vocals were truly well ahead of his time. After John Lennon was shot and killed, Harry became a strong advocate for gun control, giving up music to join the cause. Sadly, he passed away in 1994 of a heart attack, just as he began working on his first new album in nearly two decades. I can’t think of a better way to honor this legendary singer-songwriter than picking up one of his best creations today for $5 bucks. It’s one of the better throwback albums I’ve listened to recently, completely worth your spare Lincoln.